Papergreat: Postcard: "Redbay and Castle"
Here's an old postcard that was left over from the Labor Day Weekend Postcard Blogathon. 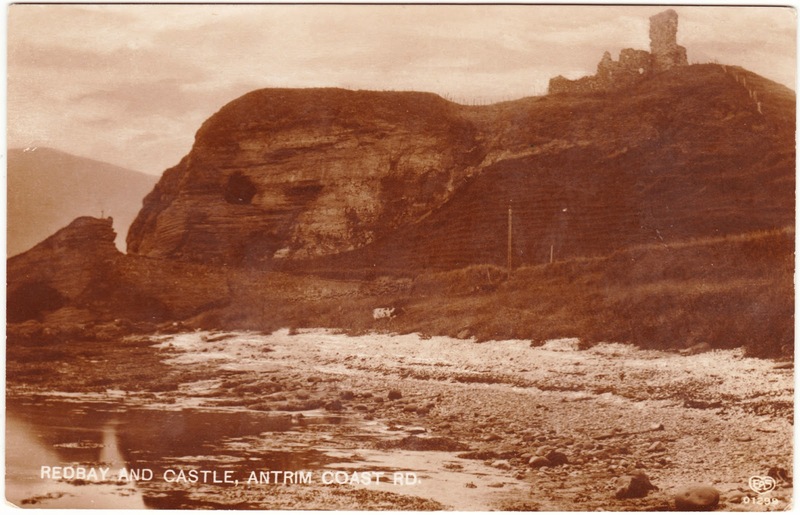 The sepia-toned card is labeled on the front as "REDBAY AND CASTLE, ANTRIM COAST RD." This location is Country Antrim, located along the coast of northeastern North Ireland. Sitting atop the hill, in the upper-right corner of the image, are, indeed, the ruins of Red Bay Castle (or Caislen Camus Rhuaidh in Irish). The castle was built in the 13th century, and, like many castles, it was host to battles and murders and weddings and family intrigue over the centuries. It was totaled and rebuilt several times, so you would probably want to check its Carfax history if you're interested in buying it. It looks like the most "recent" destruction came at the hands of Oliver Cromwell, in the 17th century. And not much was done, restoration-wise, after that. Indeed, these are just ruins now. The website Castles.nl features some modern photographs of the site and states: "This is a small ruin, with little distinctive features but there are great views from the site of the great landscape around you." Unfortunately, it's also noted that the ruins are located on a private farmland and there is no public access. This real-photo postcard was published by E.A. Schwerdtfeger & Company of London and printed in Berlin. According to The Postcard Album, E.A.S. was established in 1894 and expanded with the acquisition of a rival company in 1920. This card — the mailing date of which I can't make out, via the postmark — was sent to Miss Dora Lewis, Rangeley Lakes, Mountain View House, Maine. Dora was previously mentioned in this July 2016 post. "Port Rush" is Portrush, Northern Ireland, a resort town well known for its golf.